Do you work for Issuetrak? Learning about Issuetrak? We can help. VP of Marketing at Issuetrak, Inc.
"IssueTrak’s Help Desk software has been a great benefit to our organization." The Reports section is highly utilized and cherished for it provides us with Summery Reports and a Report Writer for our own Queries. We have had a few hiccups with the email notifications not sending. It is highly customizable and allows us to be more efficient in tracking issues with our end users. Excellent product with excellent support staff!!! It is highly customizable and allows us to be more efficient in tracking issues with our end users. The software is very stable and we rarely need support but in those few instances that we do, we always receive excellent support and guidance. There are a number of features that are extremely useful. The Quick Search and Advance Search options provides the ability to find information quickly. The Reports section is highly utilized and cherished for it provides us with Summery Reports and a Report Writer for our own Queries. The Email Notifications keep everyone in constant communications. Excellent product with excellent support staff!!! "A Decent Tool for Escalations"
Sometimes we'll get customers that want to compliment or make a complaint another employee. For a long time, IssueTrak was our primary tool for doing this, through the Feedback section. This could just be the way my company programmed IssueTrak, but a lot of times we couldn't find the employee in IssueTrak to assign the complaint properly. I would find the employee in our employee database no problem, but I just couldn't pull them in the Feedback tool. I would say that most of my problems with IssueTrak are less on IssueTrak and more on how my company uses. I've seen a lot of people close my IssueTrak escalations without properly investigating. And I think the problems I have finding employees in the Feedback tool is likely due to how the employees are programmed into the IssueTrak database by my own company (like people who are there being listed multiple times). So just be careful as to how you program IssueTrak and how you use it. It can be very useful and helpful if programmed and used properly. There's a wide range of business problems we've used IssueTrak to solve. Some examples include payments being applied incorrectly or getting lost entirely, technicians forgetting equipment during service calls or installs, damage claims, and both positive and negative feedback on specific employees. I'll be honest, with my role in this process, I don't always see the end result of the IssueTrak ticket I put in. It is supposed to Email me when the ticket is closed, but that doesn't always happen. I have seen several accounts where billing issues like missing or misapplied payments got resolved successfully when the investigative process was started through an IssueTrak. I would say that tends to be where this tool is the most successful for us. I've seen damage claims resolved this way too, but those are less common than billing problems. Was inexpensive and very easy to setup and use. Straight forward displays and easy to tailor with user defined fields. Easy to create the format for "ticket". I like the Quick Picks, which are like ticket templates, thus making it easy for the helpdesk to to choose the right one and have a number of items pre-filled. Simple Knowledge base is also easy to use and append files to. We were able to configure SLAs and metrics in it. Does not support ITIL processes well. We do "change management" in it with change tickets, and that works fine. Problem management does not really fit so well and you cannot link incidents to problem tickets or known error records. Determine you ITIL needs, if you don't need a highly "ITIL--ready" tool, then this is a very good ticketing system at a good price. We use this in our IT support role. We have a helpdesk that initiates most tickets and an IT tech team that resolves them. "Simplistic yet very functional Help Desk Software!" Their REST based API allows our team to utilize our own software's interface to create tickets directly inside of IssueTrak. Alternatively, users can also email in their tickets in case they cannot reach the software. The best part about this is that we can have their user information tied to the ticket, meaning we do not have to dig and hope that we can tell *who* submitted the ticket! The only thing I would like to see less of is new windows. In Chrome, when opening various links within the software, it opens a whole new Chrome window instead of opening a new tab or just taking me straight to that page versus opening a new window/tab. Upon implementation, try to do as much administration configuration (ie, additional fields, status types, projects, issue templates, etc.) so that your users are not required to do data correction in the future. Also, make sure to reach out to IssueTrak with any questions you may have! It has solved our failure to keep up with all of the customer communications. We started being able to respond to customers more efficiently using IssueTrak, even though we don't use it to it's fullest potential! We dropped response time drastically. The number of opened tickets has dropped drastically over the course of the years. Thanks to the support from IssueTrak, we learned that we were misusing the software during a training session that assisted us with a ton of duplicate tickets. It often times doesn't pre populate where it has to be routed to, and all the different areas and division we work with makes it incredibly difficult to get it correctly routed. It could also be simplified more, there is definitely a learning curve when you first start using the program. Solving customer campaign issues, billing concerns, technician feedback, damage claims to customer's property, collection and payment services issues. It has a lot of benefits, it allows us to do our job more efficiently, while ensuring customers get contacted back about their issues. The product is robust yet intuitive. The feature set covers almost anything one could need out of a tracking product and the optional modules cover ancillary needs in exceptional fashion. The support staff is exemplary and clearly demonstrate an intimate knowledge of the product. Initial setup can be a bit esoteric. Staging the product may require getting acclimated to certain terms and language exclusive to the product. Also, different facets within the product maybe dependent on other facets which may not be readily obvious during the initial configuration. When we outgrew our internally developed ticketing system we were referred to IssueTrak by industry colleagues. Migrating to a purpose-built product facilitated all aspects of our ticketing process. Streamlining the submission, assignment, and reporting process has been instrumental in granting a greater insight into how effective we are as a department and an organization as a whole. Email to ticket, organizing the trouble tickets, next action ticket to individuals and reporting. Setup was simple and effective to managing my IT Department and Lock Desk at this Mortgage company. I don't like to having to purchase a license for each individual I want to have the ability to pass on tickets to others as this reduces the effectiveness of getting the tickets in front of the proper person in a timely basis. Most important issue is giving users a direct link to access the system and submit tickets as the security level is minimal. The software needs to be updated to a tier 3 / layer 3 capabilities so they can securely access via a website and have the data back in the DMZ protected. This will require a clear project in mind before getting Issuetrak experts to help you design it. Internal access is great, if you need tickets submitted from outside your network you will require the Email to ticket module setup. I thinks its best to get two individuals primarily evolved with setup and administering this software. Too many and too few that know the system was a problem in the beginning. Fast response time to helping 700 employees with computer issues and allow Loan officers to request Rate locks quickly and effectively. The ability to store existing users and be able to search for them. Also the ability to categorize the different jobs that are sent in. I like that we are able to directly communicate with customers compared to our previous desk where we simply logged our communications, whether through emails or calls. The very limited formatting of messages is inconvenient for the nature of my work. It would be nice to be able to use tables and graphics without having to attach files. In addition, the character limit when emailing the issue is too limiting as some of our email communication can get lengthy. IssueTrak is a powerful tool for overseeing the work that is being done in your company. It allows you to see the categories of products we have the most questions for compared to the least amount of questions. We are able to keep track of the data of our work. It allows us to see which areas receive more questions or have more issues compared with other areas. It is simple and web-based. Has clean look, and easy to maneuver. Able to keep up with fast paced environment. Would like more custom reporting for turn around time and more options for the dashboard - so that it is more easy on the eyes..
Its a great simple tool, but dont expect customizations, or custom reporting. We use this software to keep track of issues - works very well to research reoccuring issues and to see who is the star tech with closing issues. The easy of setup and use was the best. It was easy to setup and deploy to the help desk and upgrades are very straight forward. I also would like to comment on their tech support because they are very quick and helpful when we did come across a problem. This is a pretty clear and consise tool so it met all of you needs. I guess the GUI could be a little better but other than the that, it is a solid product. We use this for our IT and facilities teams to track and follow issues that are happening in our company. The Support Team! These folks have it going on. I mean they get the job done with speed, professionalism, they are courteous and make you feel right at ease! I cannot say enough! I haven't ran into anything and we've been with IssueTrak for well over 3 years now. You have nothing to lose and everything to gain from going with IssueTrak. I looked for MONTHS trying this and that before finding these guys. We've been with them ever since. Cane Garden Software has clients that need to be able to enter issues associated with any problems that occur while running our software. These issues are sent out to our cell phones and then an e-mail is sent to our business emails, notifying us that someone is in need. It really helps our response times as well as keeps an accurate database of issues that are hanging & the closed ones as well. Issuetrak is a highly versatile tool that we have been able to adapt to many paper processes in our company They have done a wonderful job at re-vamping based upon customer input, and continue to craft a better product. Support and service is out of this world. Limited flexibility in a few ares, but these are being worked on. Reduction of paper processing through digital workflows. Emails keep those who need to know in the loop, and speed up our reaction time. "hosted user (for 10+ years), 300+ user accounts. one instance -"
** both are problems when performing searches and building reports. Messaging is per instance - ideally messaging (outbound eMail notices) would be per inbound eMail address not per instance. We have both internal support team and customer facing support groups using same tool. Flexibility to use the features you need. Pricing scales to the needs of the organization. Perfect for tracking issues as well as project management capabilities. Does not require everyone connected to issues to be a paid user of the system. Takes awhile to set the system generated emails with the end users but that happens when you have the flexibility that the system offers. It is an awesome product. We have a new quoting software that we deployed and needed to be able to receive issues and be able to track those all the way through the software development process. Works great. We also use it for product project management and help desk issues. We are able to separate the two processes to our needs. Thanks for taking the time to review IssueTrak! You mentioned it takes time to set up the system-generated emails, but the result is worth it. We strive to provide flexibility to let the software work the way you want it to. Sometimes this means it take a little work to handle the different situations you want to address. But, the end result is that the software adapts to your organization. Your organization does not need to change to work with the software. Sounds like you've got things under control, but if you ever need us, please don't hesitate to contact us at support@issuetrak.com. 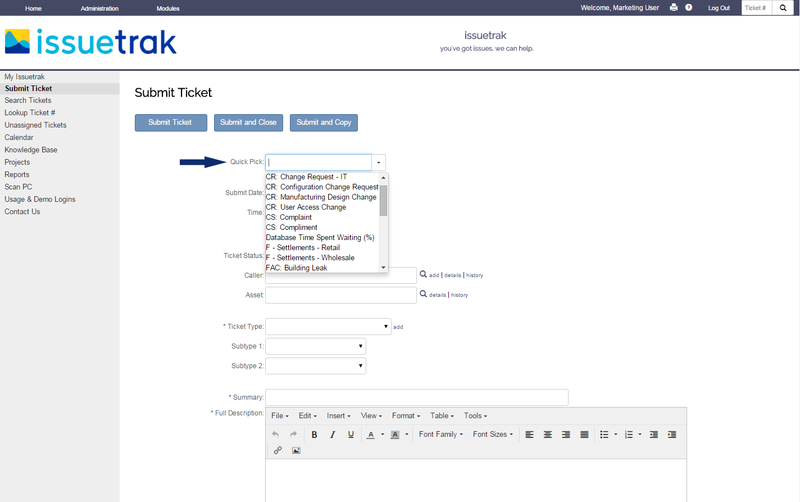 We like how easy IssueTrak is to use and configure. WIth very little learning curve, we were able to set up the system to work for our business. The users love it as well, as the input is fast and easy. 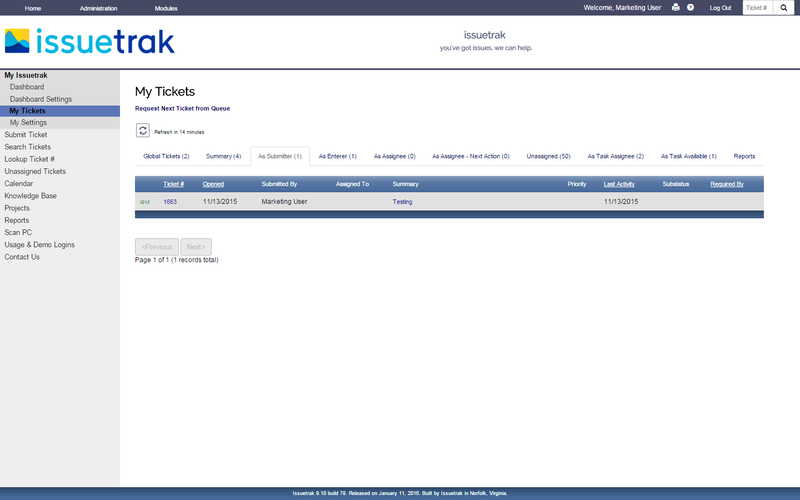 They have to crank out hundreds of tickets a day, and I can't see it getting any more efficient than IssueTrak. Honestly, I don't have any issues worth noting. If anything has every come up, the support staff has always been nothing but helpful. Even when the issue is on my end, they work hard to help me fix it. Make it yours. The more we configured it to our environment, the better it got. We maintain and operate roadway/tunnels. All incidences and events must be logged via a contract with the state. IssueTrak streamlined that process, which used to be done via text documents. Thank you taking the time to write a review. It's great to hear your comments about how fast the app is to enter issues! This will help you keep track of service related issues, call-in and requests with ease. It allows me to communicate swiftly and professionally with clients and provide good customer service. "I am product owner of the application for my organization"
We are using Issuetrak to manage internal IT helpdesk tickets. "In the process of rolling out a new application using Issuetrak. Some things like developing screen"
Product is easy to use after a basic understanding is provided with setting up Organizational Structure. As stated earlier, developing screens is relatively easy. Don't need to rely on a technology resources. Need additional screen features such as the ability to have checkboxes, allow questions to be on left and right from a design viewpoint, and, provide more options for sorting in My Requests and more download capability throughout the application. Trying to use this as a tool to track client requests. Not rolled-out yet. "Full featured issue tracking system"
Simple to use and maintain, and it is very flexible. Not a lot of work to maintain or upgrade the software. A lot of flexibility, as well as a good training site that offers good ideas on usage of the site for different applications. I don't think that the mobile version is that great. I'd love to see a true iOS/Android interface to deal with the system that actually takes advantage of touch and not just a minimalist web version. Also would love to be able to scan barcodes with it to aid in Asset Tracking. It can be a omprehensive solution ticketing system. It uses a external mailbox of the customer which allows the customer to control who will receive ticketing notification. This also allows versatility in managing the ticketing system. We have been able to track outages at are call centers. This has allowed us to be more responsive. The ease of which tickets can be resolved and also monitored for progress. This helps in the case of miscommunication or system glitches. I would hope that the number of tickets that can be tracked at one time will increase. Anywhere from equipment functioning to technical input of software. The benefits of this program is that it can be applied to a number of issues. Since we're in the implementation phase, nothing yet. If you're looking for a simple case tracking application, this will do the trick! "IssueTrak is a solid support management tool." IssueTrak allows us to manage our support requests along with managing and tracking our assets. One key area where IssueTrak has helped us is to monitor when equipment needs to be replaced. It also helps to share information across the helpdesk users. The GUI is a little dated compared to other products and it would be nice to see some additional mobile features. Look past the user interface and give it a try. We appreciate you taking the time to write a review. We're glad that IssueTrak is allowing you to improve request tracking across multiple departments. We take your comments about the GUI to heart and we are working on that as we speak. "User-friendly help desk solution for any-sized business"
The automated inventory of computers. Web-based interface that works great on mobile devices in the field. The custom reporting for end of year inventory is critical. We wish there was a way to search for printers and inventory the automatically. Support is excellent and available after hours. Our help desk tickets are organized in one location and can be used for tracking and reporting. Tickets can be tied to assets. LDAP makes user management simple. Thank you for your review, and we have taken note of your request to discover printers automatically. "Some critical processes need to be addressed. With that said, Issuetrak has lots of potential!" The overall UI is professional looking, without being BORING. Declaring "rules" allows us (the users) to control the outcome of major processes of a helpdesk system. Character limitations of any sort; the content rich editor is way too elementary. Non web based helpdesk systems have a lot of room for customization, security control, etc.--keep in mind that this type of system requires extensive validation. Our organization is now utilizing helpdesk-related statistics efficiently. "IssueTrak has really helped streamline, track and document our customer calls"
some of the search and reporting features seem "out dated"
We have large volume of customer support calls that may need multiple people within the organization to address. IssueTrak not only increased productivity but ensured that all customer's issues were being properly followed up on. The custom reporting capabilities. Our organization can pull or automate reports per client. User interface could use an update. It is simple but it looks a bit dated. "Very flexible for various workflow tracking." At its core it is meant for Help Desk, but with good configuration can be used to track internal work flows. The permissions per user and group are not as detailed as needed at times. I have used IssueTrak for the general Help Desk solution, but also for tracking business workflows such as on boarding, recruitment, accounting processes and more. "IssueTrak is an excellent product." 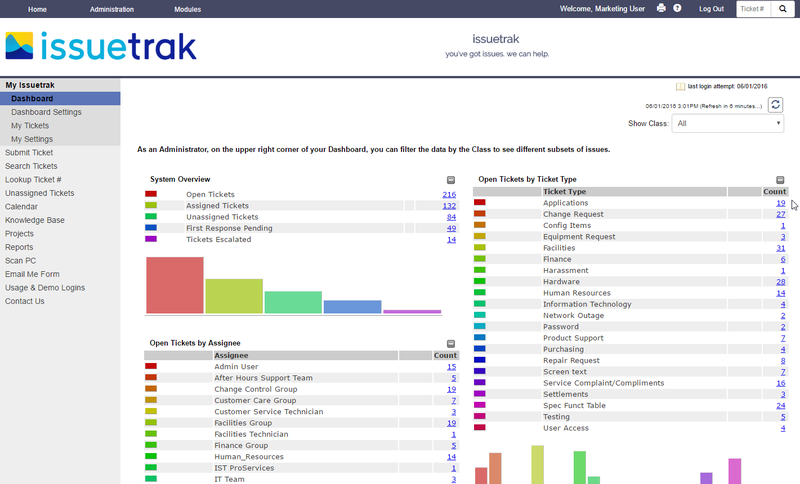 IssueTrak is a consolidated system that allows us to track all of our user's help tickets in one location. The fact that it links to our email system and Active Directory make it very seamless for our end users. Does what it says very simply and elegantly. Fast, complete resolution of end user issues and the ability to research when a similar problem recurs. The ability to integrate this application with insisting software is quite good. This makes the software useful when you already have existing processes. The initial process of setting up is probably the only issue I saw any bugs during the configuration process. I only worked with the program when I was in the ecommerce ticketing world in which we were working across multiple platforms. Other software we saw couldn't integrate as well. "Implementation of Request Management System"
Many options for configuration enabled a well-received and effective implementation of the system. Very user-friendly as we have received a 94% end-user satisfaction rating since roll-out. Printing so that you get a full view of individual issues is problematic. Can do a huge dump to an Excel spreadsheet, but that is bulky and unmanageable. If I know a particular issue is going to be reviewed, I'll do a screen capture using Snagit, but that doesn't always print in a friendly format (if the issue has a lot of notes or tasks). We have centralized inquiries coming into our company through IssueTrak. Have maintained a SLA compliance percentage in the mid to high 90's. As I have already mentioned, internal satisfaction is high, and external user satisfaction is even higher (94% either somewhat or very satisfied with experience). It would be nice to have an ability to have issues auto assign to person filling out the issue. Reports are not as user friendly as we would like I find it easier to run SQL to get many of the answers that I seek, but I am more comfortable in that then working through the predefined set up of IssueTrak. Finding and being able to show the business the users and processes that seem to require most of the IT staffs time. The interface is sometimes difficult to use. Ease of use. Flexibility. User experience. User of User-defined fields. Nothing too much. We pretty much like the product as we are using it now. Day-to-day issues regarding Oracle and Networking problems. "Good Web Based Software... "
Being able to customize using your own company logo on the main start up screen. Every website that i go into has some kind of a ticker-tracker of how many has logged in to the site. IssueTrak does has this option or not available at all. Medical and equipment issues. Customer can log in using their credentials to view reports on their old submissions. "Reliable, cost effective and meets our needs. " Email capabilities, ties to Active Directory and web login. Reports can be difficult to produce without much SQL knowledge. Reports can be difficult to run without SQL knowledge. Canned reports are good for analysis, but cannot be exported. Works with Google Apps for Education without issue. Public school, K-12 classroom, administrative and software based issues. Easily track priorities, team labor hours knowledge base. "Great product that is simple and efficient"
Customization can be limited, but we haven't had too many problems with this. great product, reasonable price, good support. Tracking issues and running reports on RCA. Very customizeable product with different modules and pricing. Support staff is knowledgeable and eager to help and listen to suggestions and feedback. Some features like software licensing and asset management could have more restriction levels of who can modify what. As is it's all or nothing add/modify/delete or read only. Can't give just modify for instance of specific fields. Software license feature allows export to excel and is tied to asset function so could be more private and secure. Can only have one asset per request. Locations are specific to general not general to specific. I have suggested changes to these areas maybe in next version. Be nice if users could be linked to locations as well as assets. They have a demo site where you can see it first hand. This company uses their own product for their ticketing system. Asset management for technical equipment. 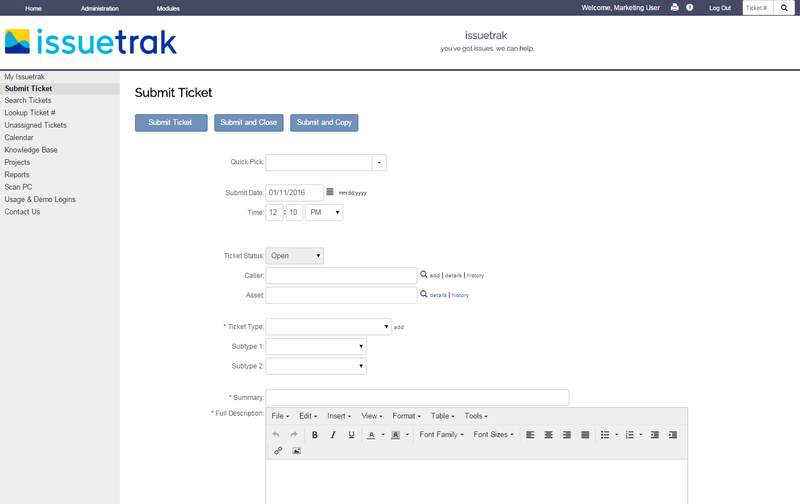 Helpdesk request ticketing system facilitating communication of requests. It tracks the issues very nicely. I am able to stay organized time wise with my entries. Nothing, no complaints about this product at all. 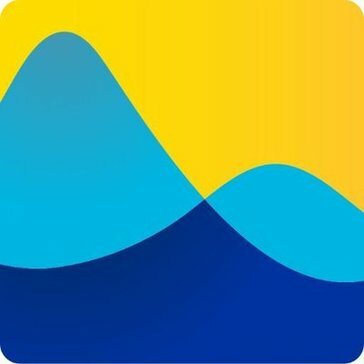 "IssueTrak has helped us develop out support and focus on areas proactively to prevent reactive maint"
Having the facility to enable users to email the helpdesk, was the biggest like for us, we used to get people emailing separate members of the team, which would cause problems for tracking the jobs. The ease of use and the dashboard overview at a glance are great. The reporting could be a little better with the inclusion of graphs, but now I have my own setup it's not a big problem to get the numbers out and type them in to my spread sheet. We chose IssueTrak to solve the problem of having all helpdesk support and knowledge base documents in one place, with all users having access to the same resources rather than running an internet search to get different answers to problems we now have the same answers that have been researched by technical staff and tried and tested in our environment. The ability to track issues on the helpdesk has given us a very good step to solving issue with users, working in education we have some users who would try to circumvent the system to get things done quicker or fail to report issues. We can now track every job through the helpdesk. Glad to hear that you're able to export data to spreadsheets easy enough so that you can then do graphs. We'll be improving the graphs in the dashboard next year. And your request for graphs in the reports is duly noted!